The Manic Street Preachers' continued success does little to ease the unhappy life of its leading light. Bournemouth, 1992. It is a miserable rainy Tuesday afternoon I had spent the morning wandering around, trying to find the hotel, and wondering why the older natives of Bournemouth seem quite happy to sit on garden walls, fully exposed to the rain, and wait for their buses. It looks as though someone has been around the suburbs, dropping grannies off, and forgetting to pick them up again. It is the first time that I have gone on tour with a band, and I am slightly nervous. Having read Hammer of the Gods and watched Spinal Tap too many times for my own good, I rather expect the band to be insular, selfish,self-obsessed and stupid. I suspect it might be quite awkward having to hang out with them for a whole day. I worry that people will think I am a groupie, so I selfconsciously carry a notepad and pen around with me at all times. I rediscovered this notepad in a box of junk last week; it is filled with noughts and crosses, and a shopping list of make-up I intended to buy. I had started smoking the week before I went to Bournemouth. I remember sitting in my hotel bedroom, practising how to light up in front of the mirror, and reminding myself to inhale. There is a knock on my hotel door. I open it, and standing there is the most untouchably beautiful person I have ever seen in my life. His hair has that "rockstar" glow. His skin is translucent, and punctured only by two huge, soft-brown Bambi eyes. He has the kind of bone-structure that would make Kate Moss's agent weep. This is beauty beyond lust. His name is Richey Edwards; his band is the Manic Street Preachers; and he cannot play the guitar. Instead he writes the lyrics, draws up their manifestos, does most of the talking in interviews, and looks beautiful. He is doing this very well today. He fusses around, making tea for both of us, charmingly inquiring as to whether I want to sit on the bed or the chair. The interview is the most intense conversation I have had in my life. I have to gallop mentally to keep up. 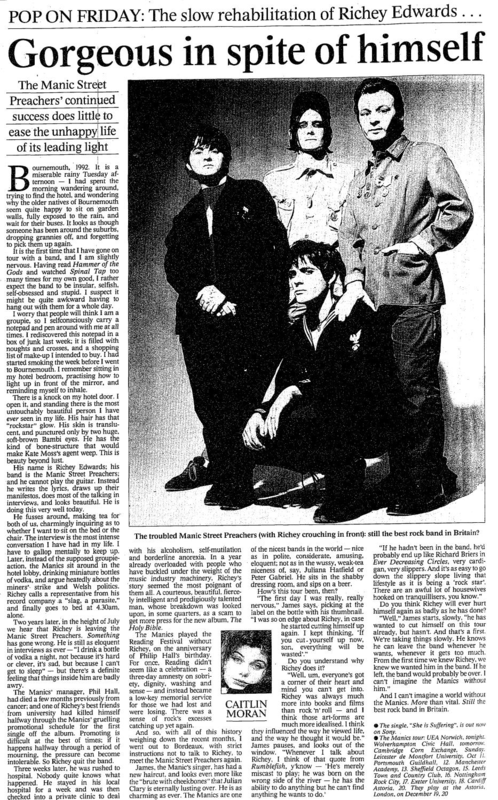 Later, instead of the supposed groupie-action, the Manics sit around in the hotel lobby, drinking miniature bottles of vodka, and argue heatedly about the miners' strike and Welsh politics. Richey calls a representative from his record company a "slag, a parasite," and finally goes to bed at 4.30am, alone. Two years later, in the height of July we hear that Richey is leaving the Manic Street Preachers. Something has gone wrong. He is still as eloquent in interviews as ever "I drink a bottle of vodka a night, not because it's hard or clever, it's sad, but because I can't get to sleep" but there's a definite feeling that things inside him are badly awry. The Manics' manager, Phil Hall, had died a few months previously from cancer; and one of Richey's best friends from university had killed himself halfway through the Manics' gruelling promotional schedule for the first single off the album. Promoting is difficult at the best of times; if it happens halfway through a period of mourning, the pressure can become intolerable. So Richey quit the band. Three weeks later, he was rushed to hospital. Nobody quite knows what happened. He stayed in his local hospital for a week and was then checked into a private clinic to deal with his alcoholism, self-mutilation and borderline anorexia. In a year already overloaded with people who have buckled under the weight of the music industry machinery, Richey's story seemed the most poignant of them all. A courteous, beautiful, fiercely intelligent and prodigiously talented man, whose breakdown was looked upon, in some quarters, as a scam to get more press for the new album, The Holy Bible. The Manics played the Reading Festival without Richey, on the anniversary of Philip Hall's birthday. For once, Reading didn't seem like a celebration a three-day amnesty on sobriety, dignity, washing and sense and instead became a low-key memorial service for those we had lost and were losing. There was a sense of rock's excesses catching up yet again. And so, with all of this history weighing down the recent months, I went out to Bordeaux, with strict instructions not to talk to Richey, to meet the Manic Street Preachers again. James, the Manics' singer, has had a new haircut, and looks even more like the "brute with cheekbones" that Julian Clary is eternally lusting over. He is as charming as ever. The Manics are one of the nicest bands in the world nice as in polite, considerate, amusing, eloquent; not as in the wussy, weak-tea niceness of, say, Juliana Hatfield or Peter Gabriel. He sits in the shabby dressing room, and sips on a beer. How's this tour been, then? "The first day I was really, really nervous," James says, picking at the label on the bottle with his thumbnail. "I was so on edge about Richey, in case he started cutting himself up again. I kept thinking, 'If you cut yourself up now, son, everything will be wasted'." Do you understand why Richey does it? "If he hadn't been in the band, he'd probably end up like Richard Briers in Ever Decreasing Circles, very cardigan, very slippers. And it's as easy to go down the slippery slope living that lifestyle as it is being a 'rock star'. There are an awful lot of housewives hooked on tranquillisers, you know." Do you think Richey will ever hurt himself again as badly as he has done? "Well," James starts, slowly, "he has wanted to cut himself on this tour already, but hasn't. And that's a first. We're taking things slowly. He knows he can leave the band whenever he wants, whenever it gets too much. From the first time we knew Richey, we knew we wanted him in the band. If he left, the band would probably be over. I can't imagine the Manics without him." And I can't imagine a world without the Manics. More than vital. Still the best rock band in Britain. This page was last modified on 15 May 2018, at 06:56.